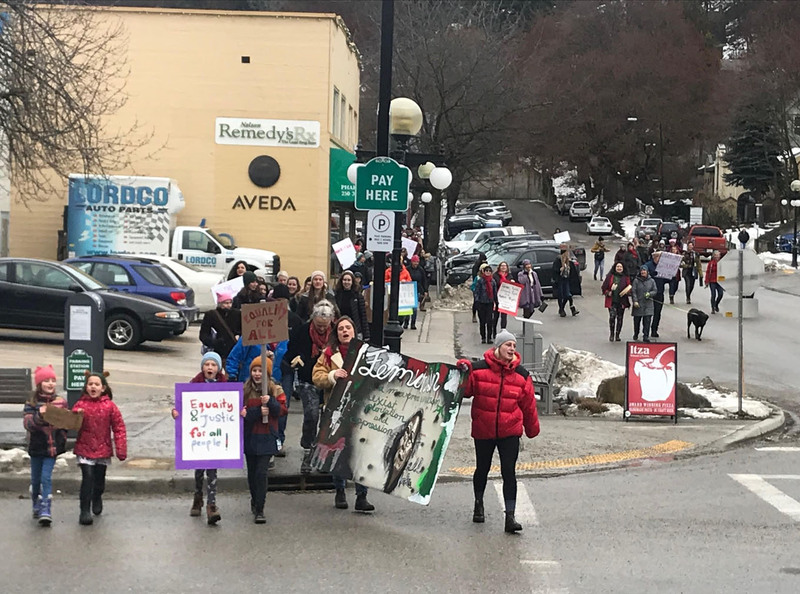 More than hundred people took to the streets of Nelson to participate in the third Women's March Saturday morning. Nelsonites joined citizens from across Canada and Washington, D.C.to support true peace, freedom, or inclusion without equality. The movement began in 2017 in the United States following President Donald Trump's inauguration. The March began at the City of Nelson courtyard where the crowd heard speech from Sinixt elder Marilyn James. Following the courtyard rally, participants took to the streets, walking along Vernon Street to Hendryx, onto Baker Street before heading back to City Hall. The Women's March attracted women, men, children and pets supporting the advancement of the rights of women and other vulnerable groups. The Women's March began at the City Hall courtyard. The crowd listened to speakers supporting the advancement of the rights of women and other vulnerable groups. The March attracted families and of all ages. The Women's March slowed traffic in the downtown core Saturday morning.